Catherine Prendergast – One of the first female Land owners in Australia. Cowie goes on to explain that Coverture is “the state of being under the protection of one’s husband. The term can also mean marriage. Marriage can then be categorized as a contract between a wife and husband where the wife gives up certain legal powers to the husband in return for being under his protections. Until the late 19th century, the marriage contract was the last contract a woman would ever enter”. Women lost their legal identity when they married. This law, which I found quite shocking, was further explained to me by a volunteer at the Society of Australian Genealogists (SAG) during my visit to their Library in Sydney, Australia on 16 December, 2017. This law changed in 1918 allowing women to own land in their own right. When we opened the ‘’Mutch’s” Muster book of 1800-1802 and viewed the entry recording the details of John Prendergast and James Clark leasing property at Mulgrave place in 1800 whilst still convicts, “that can’t be right!”, exclaimed Alan. “A convict with a 7 year term could not lease land until he had been granted his freedom”. “Could his wife Catherine, the unnamed female on the land have leased the land”, I asked? “Yes and no”, replied Alan. He then went on to explain that if a wife had a guarantor, she could lease land but usually that guarantor was her husband. In this case her husband was still a prisoner so no, she could not own land. 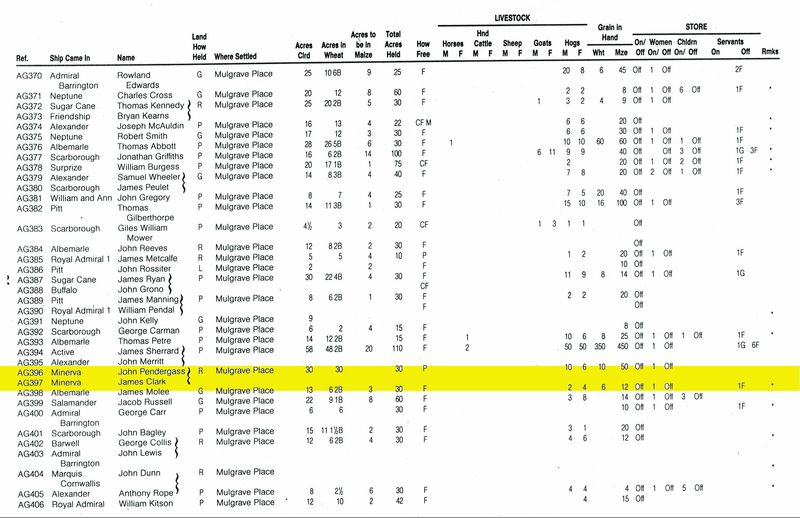 So, how did John Prendergast and James Clark lease land at Mulgrave place in 1800? 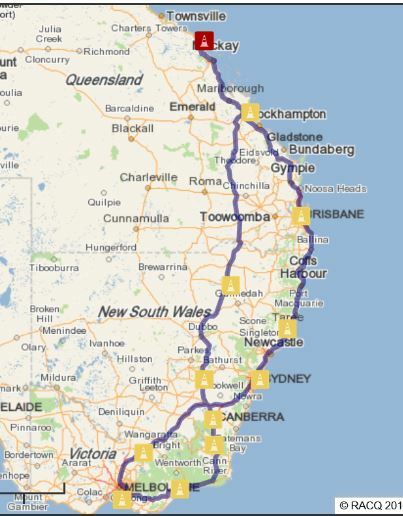 I decided to delve deeper and googled the the New South Wales Government State records and Archives site. Here I made a discovery. 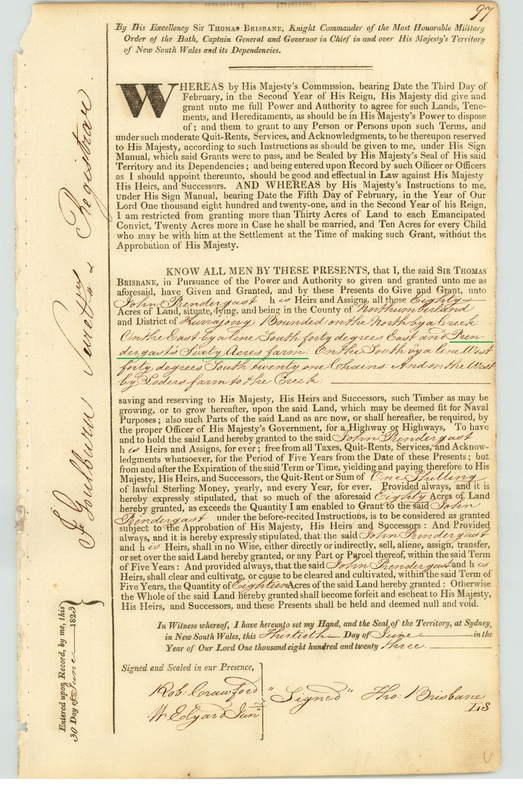 On page 2/36 it states that “Women were entitled to receive a grant of land – the first possibly being Ellenor Frazer on 20 February, 1794”. Fantastic! Now we know that Catherine Prendergast could own land. But why were we not finding anything with her first name, Catherine, on it? Remembering that Catherine Prendergast was referred to as “Wife of John Prendergast, Windsor” and also “Wife of Jno Pender, Windsor” on the two documents referring to Catherine having Jane Williams assigned to her, I decided to take a look at the Land Registry Services NSW, Land and Property Information. The document “How to Search the Old System Grant Index 1792-1862” has been superseded now but is still available on line and has a wealth of information. 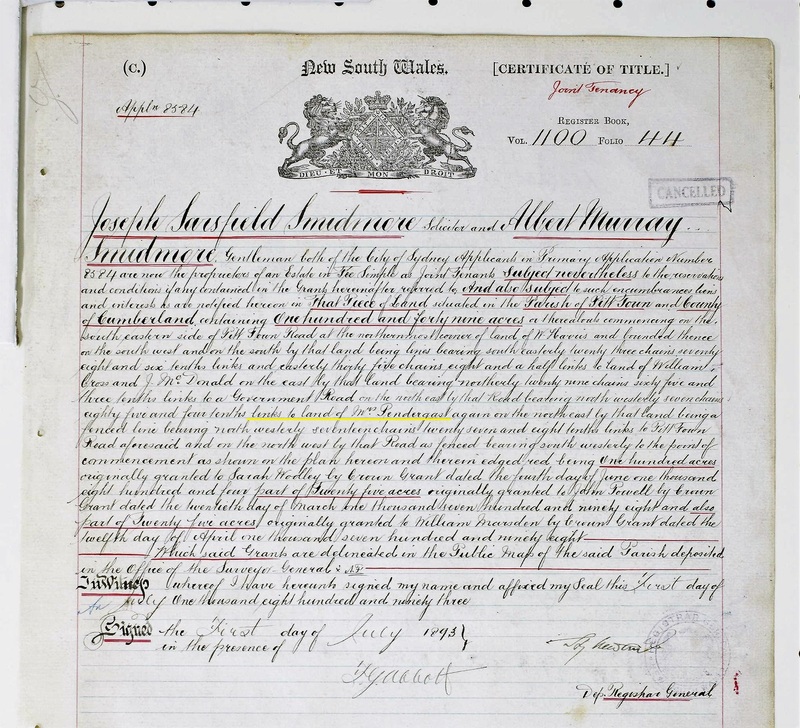 Keeping an open mind and thinking laterally as impressed upon me during my University College Cork genealogy course in 2015, I decided to trawl through the pages of beautifully hand written historical documents at the NSW Land Registry. My husband Barry became as interested as I am and continued the search when I took a break. Over the last five days we have viewed thousands of documents. I have to admit that the Land Registry Services NSW site is not the most user friendly site that I have used. It is quite complicated to use and to find information the user needs to have a prior understanding of the what he is looking for. For instance, the volume and Folio numbers or the serial and page numbers of a particular document. The surname initial is usually not enough. When I phoned the NSW Lands department for help I was advised that I might be better off to employ a conveyancer or a solicitor. Not to be deterred I soldiered on and low and behold – Drum roll please – I have made two invaluable discoveries. 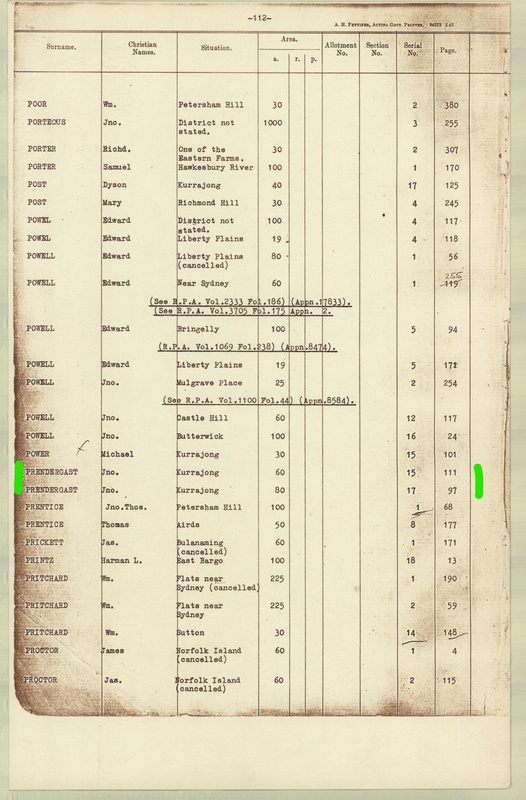 The next Deed refers to “Prendergast’s 60 acre farm” and yet when there is a male owner, the first and surname is mentioned on every document that I have viewed. Is this Catherine Prendergast’s land also? It appears to me that although Australia in the colonial days was liberal in allowing women to own land, where a woman was legally married to her husband, she, as was common law doctrine, lost her identity. Her Christian name was no longer used, she was addressed as Mrs. Prendergast in this instance and all her possessions were amalgamated with and under her husband’s ownership and control. This might explain why her son, baby John when he grew up wrote his Will with strict instructions that his daughters were to inherit land in their own right and that their husbands were to have no control over it. But, that is another story, one I will post at a later date on my blog. Catherine Prendergast – I have found you! I had read in numerous records of Catherine being everything from mother “Unknown’’ (to John Prendergast junior), to having died in childbirth. There appeared to be no records of her existence after 1801. I set out on a journey to find her and I believe that I was given divine intervention with a lot of help from Archivists along that way. In 2015 during a visit to Dublin, I visited Glasnevin Cemetery. Archivist Lyn Brady worked her magic on the keyboard and up popped a record of a Catherine Prendergast interred in Grave K64 along with 13 other Prendergast family members and some of their servants. As I walked through the eerily quiet older section of Glasnevin cemetery, I was the sole visitor for the day. Just as I reached Grave K64, after much searching, a strange thing happened. Out of nowhere a little girl, aged about 4 years old appeared. She caught my attention because her parents were nowhere to be seen and I kept thinking “This is no place to leave a small child on her own” She was chasing after a Sea Gull. This in itself seemed strange as we were nowhere near the sea. As she drew near, skipping and laughing I noticed she bore an uncanny resemblance to my own daughter Gretta at that age. She was very beautiful and even had the same gorgeous glossy long black hair with pale skin and rosy cheeks. As I looked closer I started noticing more details. Her hair was not cut evenly and appeared to be ragged on the edges. Her clothes were not modern. In fact I recall seeing photos of little girls in the 18th century wearing similar clothes. She had on a pink smock, white blouse underneath with white apron over her smock. As she skipped she ruffled her dress and I could see petticoats beneath her dress. She wore thick white tights and little brown shoes that I had not seen before. They seemed to be laced up leather shoes and moulded to her feet. When I glanced away and looked back, she was gone. I never saw her again. Although the Headstone was hard to read, I felt sure that I had found the right grave and was surprised to see how similar the vault was located in the cemetery in Dublin as it compared to John Prendergast’s family vault in Windsor, New South Wales, Australia. Both Vaults/Graves were situated beneath a tree and each had other family members buried with them. John Prendergast has 22 family members buried with him in his vault and Catherine had 13. One of the many admirable traits of the Prendergast family is their love of family and the need to take care of all their loved ones. Finding Grave K64 at Glasnevin Cemetery in July 2015 set me thinking. Did Catherine Prendergast die in Australia and were her remains returned to Dublin Ireland for burial? Did Catherine Prendergast return to Ireland shortly after the birth of her child and leave baby John just months old in the care of her husband and why would she do that? Were there other children from the marriage of John and Catherine who were being cared for by family in Ireland and had Catherine returned to Dublin to collect these children with the intention of taking them back to Australia? And, finally how did Catherine Prendergast travel back to Ireland? Being a Geni Detective I had to analyse how Catherine thought, how she planned and how she put her plan into action. Firstly, I discovered on Ancestry.com two possible children from the marriage of John and Catherine Prendergast. The most likely one is Patrick Prendergast born in 1797. This child may well have been named after John Prendergast’s father Patrick, thus the Irish naming pattern having been adhered to. This could have been the child that Catherine rushed back to Ireland to collect. Secondly, Catherine would have realised that John Prendergast could not take care of a New born on his own let alone run a farm and keep a house without assistance. These questions needed answers. On Saturday December 16, 2017 whilst on a visit Sydney, I decided to conduct research at the Society of Australian Genealogists (SAG) office and met Alan Day, a volunteer who had been researching genealogy for 60 years. His knowledge was invaluable and he was very enthusiastic and helpful. Alan helped me to find information relating to John Prendergast in the “Settlers’ Muster book of 1800” where there are two convicts renting 30 acres at Mulgrave place. One is named as James Clark and the other one is John Prendergast both convicts and with the letter P (Prisoner) beside their names. They arrived as rebels on the Minerva. Alan expressed surprise that two convicts were able to rent land whilst still prisoners. There is also interestingly, one unnamed female not listed as a convict. Was this Catherine? Did James Clark and John Prendergast both still convicts without their freedom, lease a farm or did Catherine lease the farm? Were both the convicts assigned to Catherine? They were all recorded as “Off store”. How could this be so early in their existence in the Hawkesbury? This was unusual for a Convict to be self-supporting. Was Catherine independently wealthy and able to provide for them all? We know the Muster was taken in June/July 1800 so we now know that Catherine had not yet given birth to baby John at that stage as there are no children recorded at the farm. On 14 December 1801, on board the convict ship Nile, we know that Jane Williams arrived at Port Jackson. Having read the chapter in the book “Sinners, Saints and Settlers” by Richard Reed and Brendon Kelson, I read recall how Convicts were selected and assigned to free settlers. Along with many wealthy English wives of important men in the colony, waiting on the docks to hand pick the Irish girls for servants was one very gutsy, intelligent and independently wealthy Irish female by the name of Catherine Prendergast. Catherine on the other hand picked an English girl to be her Governess for baby John and Housekeeper for John Prendergast. Fortunately for the survival of our Prendergast family Jane took great care of baby John and John senior as no harm came to them. They thrived and prospered and 6 generations later I am here to tell the tale. What proof do we have that Jane Williams was assigned to Catherine Prendergast? On Friday 15 December, with the help of Gillian at the Australian National Maritime Museum at Darling Harbour in Sydney, I finally found the information that I have been waiting for so long to discover. My cousin Mark was with me and as delighted as I was to find this latest information. On Saturday 16 December whilst trolling through “Find my Past” citing the NSW State Records and Archives, I discovered the record that states Jane Williams was assigned to the “Wife of Jno Prender, Windsor”. These two records prove that Catherine hand picked Jane to take care of baby John and John Senior and that she survived the birth of baby John. As for how Catherine returned to Ireland, I have yet to discover the answer to that question along with the many other questions that have arisen during the quest to find Prendergast ancestry. As for the little girl in Glasnevin Cemetery, when I got back home to the Whitsundays in 2015, I read all the names of the others interred in K64 and found that a little girl by the name of Catherine Prendergast aged 4 had been buried there. When I googled “Life threatening illness prevalent in the 18th Century with their symptoms”, I discovered that Cholera caused hair loss and breakage, thus explaining the state of her hair. The record does not show the cause of death but the little child that I “saw” may well have been the little child Catherine who is buried along with her Grandmother Catherine Prendergast. Following the Prendergast trail down the East Coast of Australia. The Quest to find Prendergast family continues. Genealogy begins with you! To ensure that no stone is left unturned, we begin the challenge of putting the family history pieces together with the information that we already know but may not have collated about our family. Our siblings, parents and grandparents are our most immediate source of information. We then move on to the next generation who by the time we commence our genealogy research may have passed on and we are relying on discovering details of their lives through older living relatives or at the various on line sites or at various repositories. The most accurate way to gather information is to visit your living relatives and in a relaxed atmosphere, talk about their memories of family members. Along the way they may dig up documents to show you that you can then photo copy and add to your research. Nothing beats sighting a primary document. It is always a good idea to let your relatives and the various repositories know of your plan to visit well in advance. Tell them what you are hoping to discover and enlist their valuable help. Once you have set your dates ask them to keep these dates free so that you don’t miss seeing them as they have prior engagements for these dates. This saves a lot of time and disappointment in not seeing that very special person that you really want to find that important detail from! And so, the quest to find Prendergast family continues. I decided that the fastest, most accurate and fun way to piece together the missing parts of my Australian branch of the Prendergast family is to visit them, sit down over a cup of tea and chat about what they know of the Prendergast family. I have let them know that I am coming to visit through other relatives, emails and telephone calls. I have advised the dates that I will be in the region and when booking accommodation in these regions have let the owners know of my quest to find Prendergast family. Already I have had success!I have a team of very enthusiastic Prendergast family members, Archivists, Librarians, Conservationists and even local Mayors awaiting our visits. This is so exciting.